This ultimate spring pizza is loaded with awesome veggies! 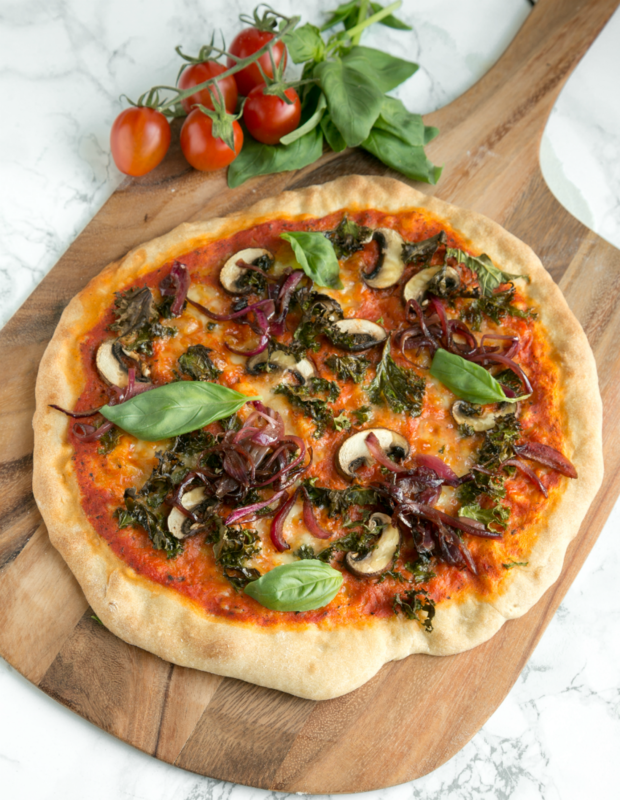 Mouthwatering caramelised onions, kale and mushroom make this great vegetarian pizza the perfect way to celebrate the new season. My top tip? 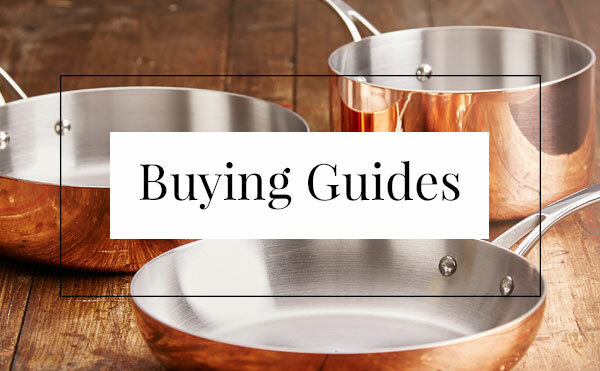 To make the best pizza at home, I recommend you invest in a pizza stone, which will magically give you the closest result to the typical Italian wood-fired pizza stones. Preheat oven to 220°C with the pizza stone positioned on the middle shelf, and allow to warm up for about 30 minutes. In the meantime prepare your toppings. Start with the marinara sauce: simply mix together chopped tomatoes, oregano, chopped basil leaves, extra-virgin olive oil and salt and pepper to taste. Set aside until needed. Cut the mozzarella into small cubes and pat dry with kitchen paper. Set aside until needed. For the caramelized onions: heat the extra-virgin olive oil in a small skillet over a medium-low heat. Add in the onions and balsamic vinegar and cook over a low heat for about 5 minutes. The bottom of the pan should be glazed with a brown fond, pour in the water and scrape the bottom with a wooden spoon. Continue to cook for a further 10 minutes until the onions are completely softened and lightly sweet. Set aside until needed. Sprinkle a clean surface with a little flour and arrange the pizza dough on top. Press the dough down with the palm of your hands and gently stretch the sides until the pie is thin and you have formed a medium-sized circle. Transfer the base onto a lightly floured wooden pizza paddle. Spread 3-4 spoons of the marinara sauce over your base, making sure to avoid the very edges (which will become your pizza crust). Sprinkle mushrooms, kale, mozzarella and caramelized onions over the top of your pizza. Bake in the oven for about 8-10 minutes or until the pizza is cooked through and the edges are nicely brown and crisp. Remove from the oven with a pizza peel and serve immediately. 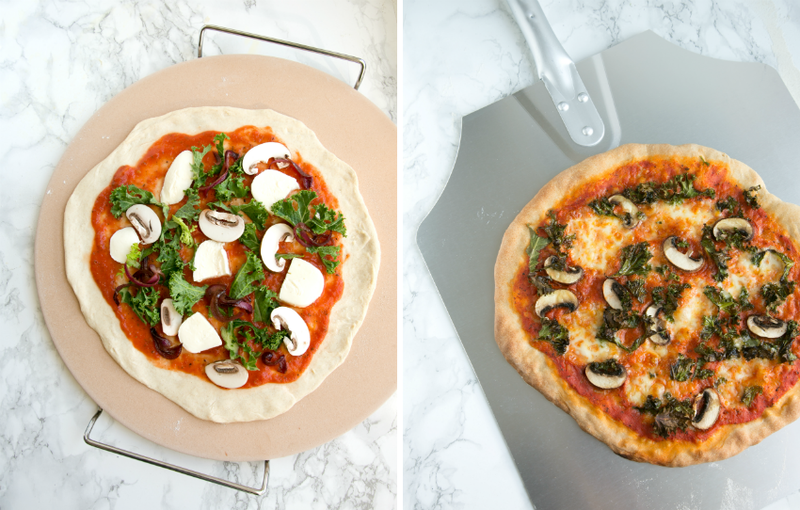 Want to make your own homemade pizza base? Find the recipe here.